Mario Party is one series that critics often complain is either A) too luck-based or B) a rehash time and time again. Mario Party 5 was the second installment of the series for the severely underrated Nintendo GameCube, and the franchise attempted to fix the latter gripe with a new capsule system. Does a new story mode, capsule system, and loads of intriguing mini-games make for a party you should accept the invitation for? 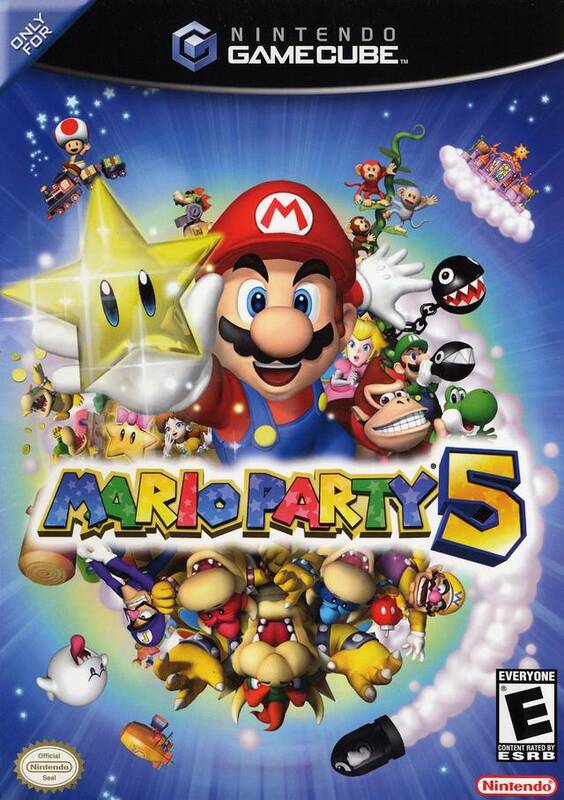 Mario Party 5's mode that most players will participate in is the Party Mode. Of course, having friends or family members to join you is a must unless you feel you can have enjoyment from playing with computer opponents solely. 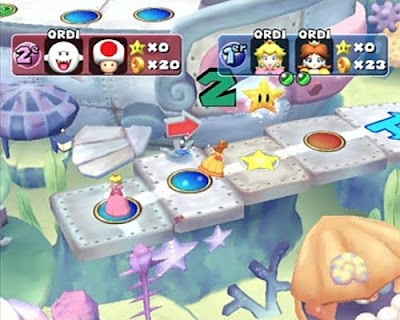 You simply select one of ten characters (Mario, Luigi, Peach, Yoshi, Daisy, Wario, Waluigi, Toad, Boo, and Koopa Kid), choose one of seven boards (the seventh becomes unlocked after Story Mode has been completed), and decide between how many turns the game will be (as short as 15 turns or as long as 50 turns). The rules of Mario Party 5 pretty much remain unchanged from past installments. Each player rolls a dice block when it is their chance to play, depending on the space they land on they can earn or lose coins, and after every turn (defined as having all four players roll) a mini-game takes place. The winner or winners of the mini-game earn ten coins unless the game is a bonus mini-game. The goal of Mario Party is to earn the most stars by the conclusion of all turns. Stars are purchased with twenty coins, and the location of the star shifts after each time a star has been bought. Daisy just edges out Peach to reach the star. There are a plethora of unique spaces for players to land on in Mario Party 5. Blue spaces net players with three coins while red spaces take away three coins. Event spaces, marked as green spaces with a white question mark in the middle, create a whole host of unique happenings. 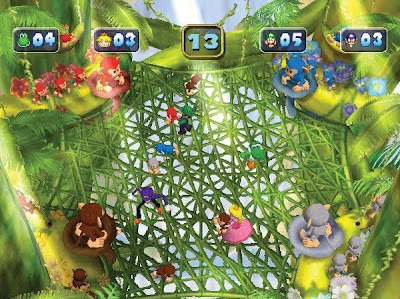 For instance, in the Undersea Dream board, a player can land on an Event space and be carried across to the other side of the board instantly. Then there's the DK space. Donkey Kong has retired from the chance-based life of Mario Party and offers bonuses for players who land on his space. This fine bloke can give coins to a fortunate player or initiate one of three special DK-themed multiplayer mini-games for all players. Likewise, there is a Bowser space on every board. When an unlucky member of the Mushroom Kingdom lands on this space, Bowser falls from the heavens to cause some trouble. He can steal a star, force players to participate in one of his mini-games where the losers must forfeit anywhere between half and all of their coins, and just make life miserable for everyone involved. The new addition this time around to the series is that of capsules. These are earned through capsule machines resting around each board or through obtaining them in special events. A player can hold up to three capsules at a time, and they can opt to use a capsule on themselves for a price, or they can choose to throw it on a space ahead of them. There is a certain amount of strategy involved with where one should toss a capsule. There are several different types of capsules to chuck such as Movement, Coin, Capsule-shifting, and Miscellaneous capsules. Movement capsules can do things like giving the player an extra dice block to use on their next turn, allowing the player to switch places with an opponent, or granting you the ability to automatically fly to where the star is located. Coin capsules do a lot of interesting things, too, such as the Coin Block space that when landed upon gives the player ten coins, the Spiny space which steals 10 coins from a player as selected by a roulette wheel, and the Piranha Plant space which eats a player and takes half of their coins. Capsule-shifting capsules like Kamek shuffles everyone's capsules while Miscellaneous capsules offer some wild and wacky scenarios such as changing the location of a star, creating a duel or chance time space on the board, or creating a space where the person who lands on it can steal coins or a star. 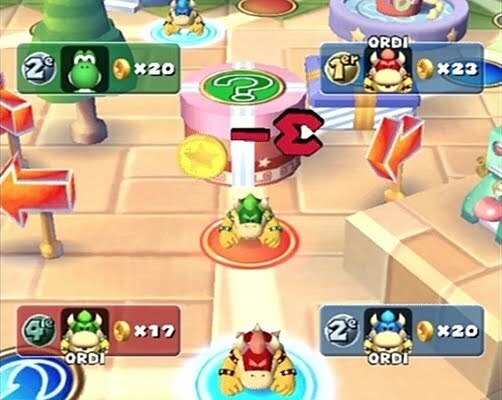 The addition of variety given by capsules is most certainly welcomed and helps mix the Mario Party formula up quite nicely. This game just comes down to mashing on the A button. Not very intuitive, is it? As stated, after all four players have rolled the dice block and landed on their individual spaces, a mini-game begins. Depending on the color space each player has landed on, the mini-game can be a Free-for-All, a 1 vs. 3 game, a 2 vs. 2 game, or on special occasions a Battle mini-game where all players put some coins in a pool. The winner takes the lion's share of the coinage. The mini-games of Mario Party 5 are mostly winners and quite entertaining. Whether you're in front of Princess Peach's castle smashing your heads against coin blocks for cash in Coin Cache, catching fallen scoops of ice cream to create the largest cone possible in Coney Island, collecting different colored monkeys and giving them back to their parents in Chimp Chase, running from a sole player who is trying to run you over with a plastic ball in Flatiator, or teaming up with another player to control the flippers of a pinball board in Panic Pinball, the numerous different mini-games stay fresh, fun, and challenging. This game actually encourages monkeying around. Get it? There are also various Duel mini-games that occur when a player either lands on a Duel space or in the last five turns lands on the same space as another opponent. These games pit two players against one another for a wager, either coins or a star. Some of these, though, are solely based on luck which is a bummer, but the majority of them require a fair amount of skill. Duel mini-games appear frequently in Mario Party 5's Story Mode. In the Story Mode, Bowser has infiltrated his way into the Dream Depot where all dreams rest. It is up to you to kick him and his Koopa Kid offspring out. The rules have you against three Koopa Kids with the goal of trekking around boards trying to win mini-games to make each of the trio of Koopa Kids lose all of their coins. However, the catch is that you only have a set amount of turns to accomplish this task. If even one Koopa Kid has any coins by the end of the game, you lose. When you pass a Koopa Kid or land on the same space as one, you play a Duel mini-game with them. When you land on a VS. space, you initiate either a 1 vs. 3 or 2 vs. 2 mini-game. This mode certainly won't make you want to play it over and over again, but unfortunately, it is a must if you want to try the final board of Mario Party 5, Bowser Nightmare. wish to unlock the seventh board. Apart from Party and Story modes, there is Super Duel Mode (a vehicle-making and battling game) and a myriad of Mini-Game Mode options such as Free Play that lets you pick and play any mini-game you have unlocked, Mini-Game Battle, Mini-Game Circuit which is a racing game where the winner of a given mini-game gets to hit a dice block (the first player across the finish line wins), Mini-Game Decathlon where ten mini-games are played and the player with the most points in the end is declared the decathlon winner, Mini-Game Wars which pits players against each other to rule the most tiles on a game board, and finally, Mini-Game Tournament that is made up of Duel mini-games. Mario Party 5 looks the part of a midlife Nintendo GameCube game. The models are nice enough, the backgrounds are decent, and the level of action seldom causes any instances of framerate drops or slowdown. 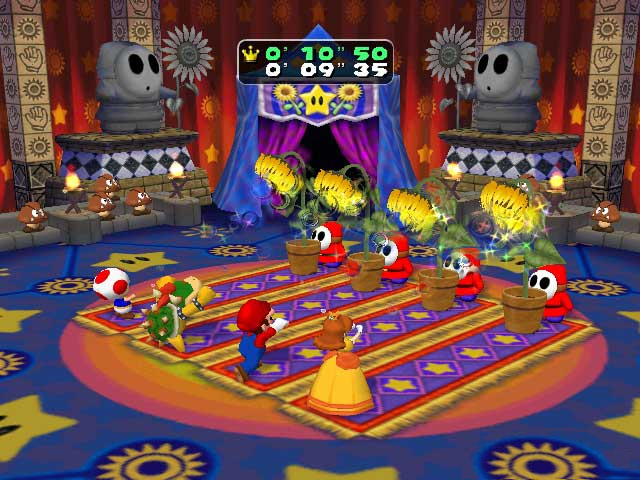 Then again, the Mario Party series has never been a benchmark for graphical prowess of any of Nintendo's many hardware, so why should Mario Party 5 start a trend? The music is quite catchy this go around with plenty of tracks and themes that will get your head bouncing side to side and your toes tapping. 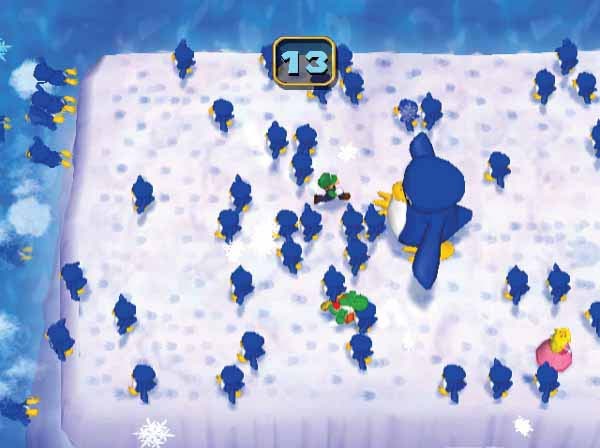 Don't be a pushover when it comes to these pushy penguins! The new capsule system of Mario Party 5 offers an entirely different way of playing the game. While it isn't as extreme of a game changer as traveling in one vehicle a la Mario Party 9, this fifth fiesta of Mario and friends introduces plenty of fun changes, incredible mini-games, and an appealing if not sometimes infuriating Story Mode. While not my favorite GameCube instance of Mario Party, Mario Party 5 does a lot right for itself and is definitely one of the stronger entries in this long-running party franchise. Feel free to RSVP and get some friends as this party might last all night!